Explore the most famous canyons of the American West on a journey featuring not one but three national parks! We begin with a welcome dinner in Scottsdale, Arizona, before traveling the next day to start our trip in stunning Sedona, where we can browse the arts and crafts shops at the marketplace and explore Oak Creek Canyon, where incredible rock formations change hue with every turn in the road. Later, we’ll make our way to the South Rim of the Grand Canyon via the spectacular Kaibab National Forest. The next day, we devote ourselves to the majesty of the Grand Canyon, what Theodore Roosevelt once described as “one of the great sights which every American, if he can travel at all, must see.” We’ll travel in Roosevelt’s footprints along the East Rim Drive and be treated to those same views. Later, we’ll stop at the historic Cameron Trading Post, which has served as a haven for travelers, traders, and explorers for nearly a century, before continuing north through the mesa-studded desert to arrive at our home away from home for the next two evenings. Take in the stunning blue waters of Lake Powell, and enjoy an early dinner there. The next day, we’ll take a breakfast cruise on Lake Powell and then we choose: a canyon adventure cruise through wondrous geological formations OR a tour of Navajo Nation, including a stop at Monument Valley Tribal Park, a sacred Navajo land featuring iconic sandstone spires. Whichever you choose, your day will be thrilling. Then, it’s on to Bryce Canyon National Park, famous for its hoodoos, orange and red rock formations created over millennia by wind and water. Enjoy a walk along the Sunset Point to Sunrise Point Rim Trail. Even grander sights await us the next day when we explore the natural wonder of Zion National Park’s red and white sandstone cliffs. Utah’s first national park, Zion offers visitors an open-air tram that winds its way alongside the Virgin River and through the 2,400-foot-deep, one-half-mile-wide Zion Canyon. It’s an experience of a lifetime! Later, you have the choice of visiting the Zion Human History Museum or continuing to explore the great outdoors independently. On our last full day, we’ll trade the wonders of the natural world for the neon lights and round-the-clock action of a different kind of wonder—the Vegas strip! Enjoy yourselves before we head home the next day with our eyes still wide from the sweeping views. Enjoy time in magical Sedona and a scenic drive through Oak Creek Canyon. Climb aboard Zion’s open-air tram with an expert guide. Experience an invigorating breakfast cruise along lovely Lake Powell. Behold the breathtaking views of the vast Grand Canyon. Explore the most amazing spires of Bryce Canyon National Park. 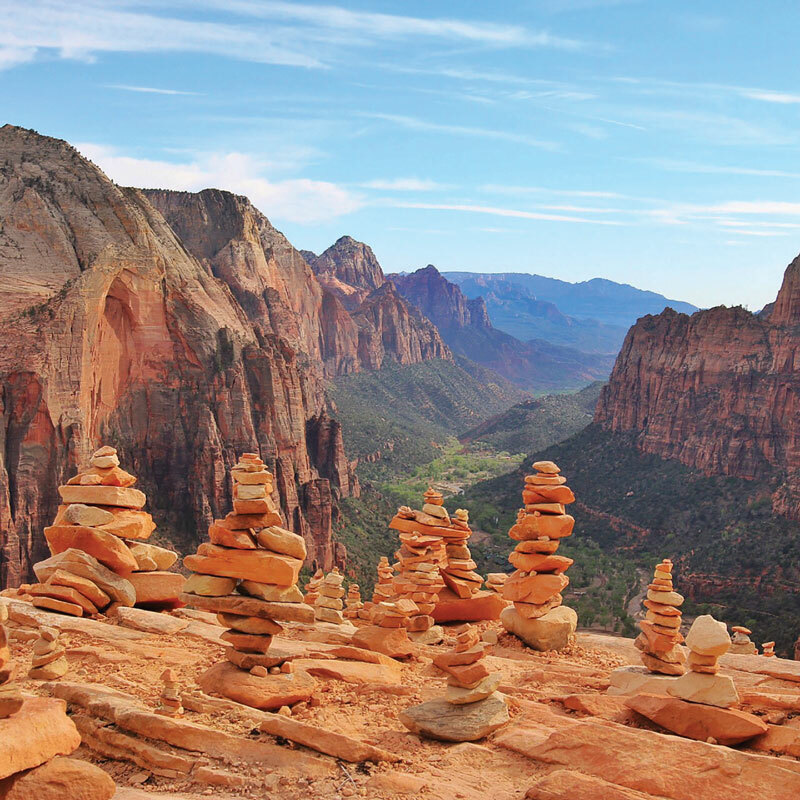 Marvel at the red and white sandstone cliffs of Zion National Park.